This VEGETATO (Woodland) Trooper Kit includes the Shirt and Pants in Italian Vegetato Camouflage Pattern. It also includes a Vegetato Boonie Hat and a 1-Hole Balaclava (OD). All items are brand new and available in size S-M-L-XL-XXL. In use by Army, Military, Police and Special International Forces. The VEGETATO (Woodland) Camouflage Pattern has been first introduced by the Italian Military Forces in 2001. It was progressively established as the standard camouflage for all branches of Italian Military (Army/Navy/Air Force) since 2004. The Woodland variation of the Italian Disruptive Fractal/Evolutive Pattern, also known as "Mimetico Vegetata", is a mottled pattern composed of jagged edged blotches made of Five-Color (Brown, Russett, Sand, Olive Green & Khaki). This pattern is primarly designed for Temperate and Mediterranean Environments. It mostly replaced the ITALIAN WOODLAND & REGGIMENTO SAN MARCO Patterns that have been used by Italy Military Forces between 1992 and 2004. Currently in use by Italy Army, Navy, Air Forces, Carabinieri and Security Forces. 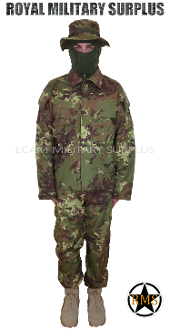 The Canada based Royal Military Surplus online store offers range of quality Military Kits, Combat Uniforms, Tactical Gear and Military Apparel in VEGETATO (Woodland) Camouflage Pattern.